"A valuable and provocative look at the phenomenon widely ignored in the affluent North but likely to be of enormous importance in the century ahead....The Next Christendomis chillingly realistic about the relationship between Christianity and Islam." "If the times demand nothing less than a major rethinking of contemporary global history from a Christian perspective,The Next Christendomwill be one of the significant landmarks pointing the way." 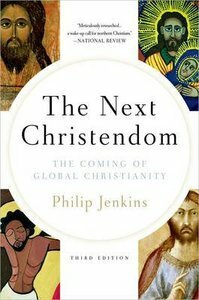 About "The Next Christendom: The Coming of Global Christianity (Expanded 3rd Edition)"
Philip Jenkins (Ph.D., University of Cambridge) has taught at Penn State University since 1980, and currently holds the rank of Edwin Erle Sparks Professor of the Humanities in History and Religious Studies. His book The Next Christendom was named one of the top religion books of 2002 by USA Today. He has published articles and op-ed pieces in the Wall Street Journal, New Republic, Atlantic Monthly, Washington Post, Boston Globe, and other top media outlets. Most recently he has released The Lost History Of Christianity and Hidden Gospels: How the Search for Jesus Lost Its Way.